This is a post about logo design, with emphasis on the word design. It’s fine to have conversations about cultural appropriateness and sensitivity, but that’s not the goal of this post. 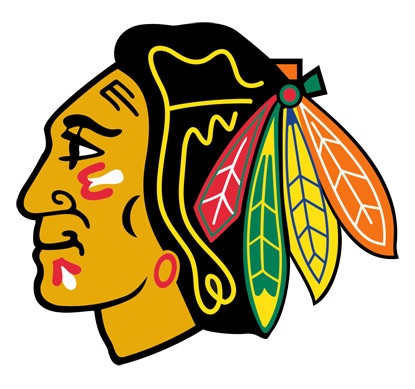 And we’re dealing with a prime design here as the Blackhawks’ logo was voted the best in the NHL in 2008 by the staff of The Hockey News. Hold up. Really? Best in the NHL? When I learned this I was a bit confused, but naturally I assumed most hockey logos were pretty bad. I Googled “hockey logos” and found that isn’t totally true. There are definitely stinkers in the bunch, but there are some good ones as well. So maybe the Blackhawks logo was different in 2008. Well, no. In fact, the team’s basic logo hasn’t changed much since 1926, when the team was founded. It’s been tweaked many times throughout the years, but the basic concept and feel has remained the same. It was designed by the original team owner’s wife, Irene Castle. As with many sporting organizations, tradition is important. I can only assume that the rich history of this logo is valued by the team and the community. And what we have is more of an illustration than a design. Now I’m not saying this is a terrible logo. And I think the team uses it well. What I’m saying is that it’s very folksy. But strip away the tradition and how well the logo is used (even the worst of logos can be used well). Try looking at it with fresh eyes and you may agree with me that this is a rather odd logo—especially for a top tier sports team in 2015. And while we’re focusing on design here, we’re also doing it in context of today’s sports scene—and by that criteria, this is a bit of a stinker. However, the question is this: is it better than its competition? Let’s put it this way. 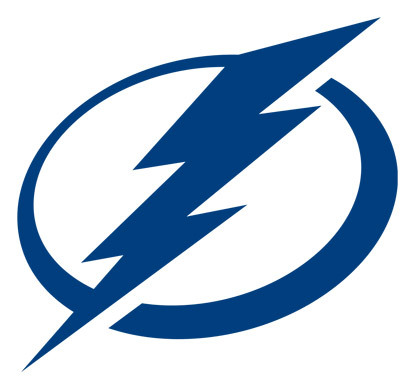 The Chicago Blackhawks logo has stiff competition in that the Tampa Bay Lightning logo design is also not great—but for totally different reasons. The logo started as a doodle by Phil Esposito, a former hockey player (who ironically one time played for the Chicago Blackhawks) and co-founder of the Tampa Bay Lightning. The original version had the state of Florida in the background. The state and other elements have since been dropped as the logo underwent a number of simplifications over the years. In 2011 the team’s current logo was introduced. And that logo is very clean with no extraneous elements. That’s what designers preach, correct? Absolutely. But there’s this thing called context. And in this case the context is the National Hockey League. Here’s the rule with simplification. When you go so far as to remove the fun, you’ve gone too far—you’ve oversimplified. And sports is definitely supposed to be fun. Their logo looks like a weather icon. It’s like the Gatorade logo minus any personality. It has motion. I’ll grant it that much. But it’s lifeless. Time for closing arguments. One one side we have the Chicago Blackhawks. Their logo was designed by the team owner’s wife. It is fun, playful, and colorful, but is also outdated, folksy, and has no apparent ties to sports. On the other side we have the Tampa Bay Lightning. Their logo started out as a doodle and hasn’t progressed much past that. It is clean, simple, and solid, but is completely forgettable and lacking in emotion and fun. The winner by a small but very clear margin is the Chicago Blackhawks. A main goal of logo design is to establish an identity, and their logo succeeds in that respect where the Lightning falls flat. But perhaps the biggest lesson learned here today is this: hire a designer. Owners, presidents, and CEOs like to have their hands in all aspects of their companies. But when it comes to developing an identity, they should leave it to the pros—not their spouses.